What’s the bike scene like in Nagoya for females? Nagoya girls love riding bicycles in any style. 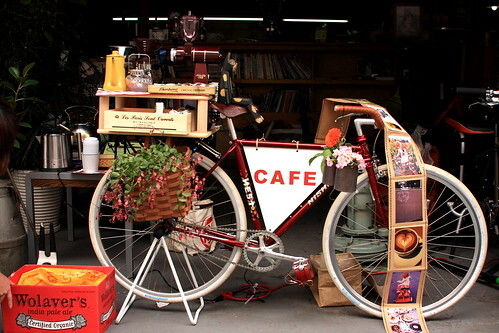 We always want to do unusual and fun things through riding bicycles, and share with lots of people. We believe “you can do anything on your bike.” So, we made bicycle dance team “Gacharinco!”, the 1st fixed gear bike dance team in Japan and Love Wheels Nagoya - 2010 Bicycle Calendar. We thought it would be cool if people saw our bike dance and calendar and thought that Nagoya is a great and fun place to cycle in. Through these stuffs, we want to share with the world all that is cool, exciting and fun about Nagoya Cycling Girls. Here are the fun bike events regularly and hope that many people would get interested to come and ride with us in Nagoya. What’s your favourite ride right now? And I love drinking super cold beer after long riding, cheers! Spinning around the globe: Sydney, Melbourne, Budapest, Leeds, San Diego, NYC… I love riding the city in different countries to explore & feel the locals and make lots of friends all over the world. Favourite food: Nagoya’s miso pork cutlets! What makes you angry? Thief! Hey Rie, I love that "old" video - you ladies have serious humor! Cheers, from the guy riding the folding bike with crankee last Saturday night.